Sometimes, a house is filled with accents and touches that define the personality of the owner as well as the items treasured over the years. And these are the elements which turn a house into a home. Yet there are times when these elements lead to lack of direction in the overall design scheme, leaving the abode cluttered and unimpressive. This was the problem that plagued Apartamento em Matosinhos in Porto, a gorgeous coastal city in Portugal. 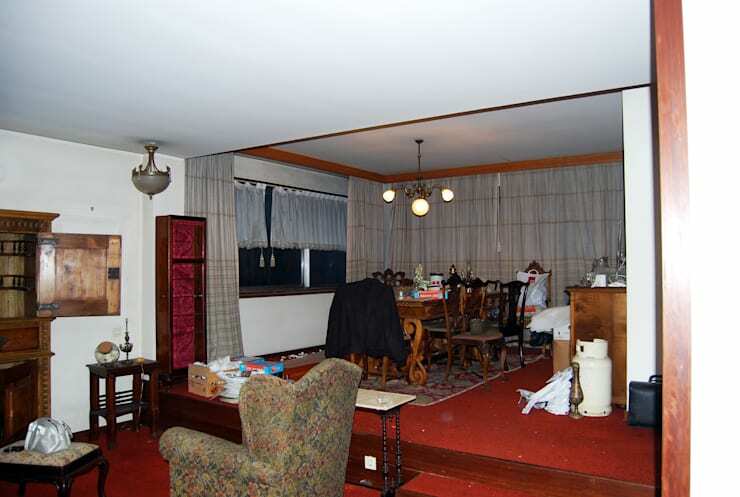 Previously, the interiors of the abode looked uncomfortably busy and housed too many elements. The furniture was of good quality but had evidently aged. The lamps were stylish at some point in time, but now needed more modern replacements. The drapes also looked tired and worn out, and seemed to hamper the openness of the room. The designers have been careful to keep the existing cosy factor going with the hardwood flooring, while the large windows are now devoid of drapes and visually open up the space. 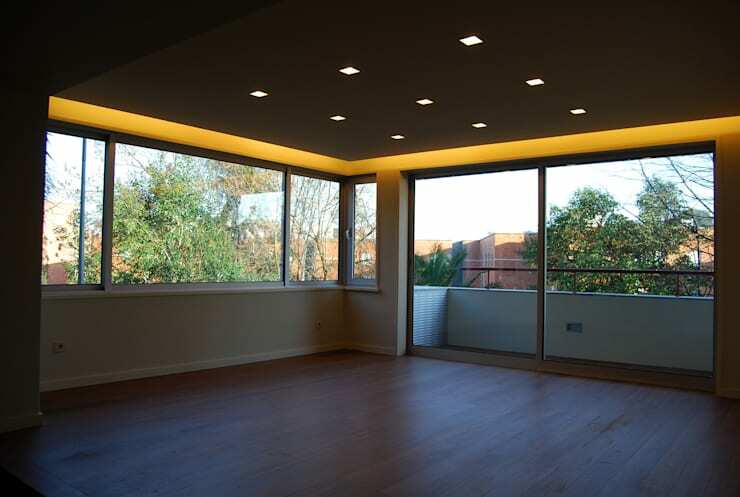 A mix of concealed and recessed lighting gently illuminates the room after the sun goes down. During the day, sunlight floods the area with warmth and happiness. 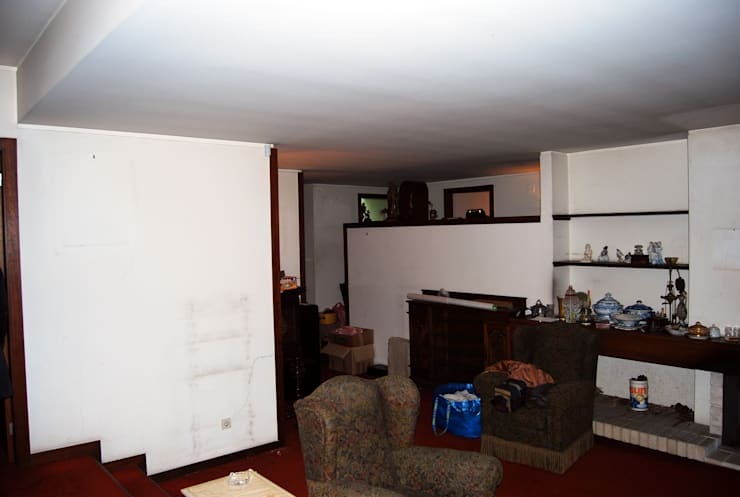 Bulky and faded armchairs along with bland white walls failed to make the required visual impact before the makeover. The knick-knacks displayed on the shelves in a haphazard manner definitely didn’t improve things. The architects felt that a bit of restructuring was required and unnecesary elements had to be discarded, to lend the space a more progressive feel. A creamy white has been coupled with elegant grey to create an entertainment unit where the television lies embedded in sleek cabinetry. The open shelves now look more apt for showing off memorabilia, while the fireplace sits beneath the TV and flanked by arrays of slim white bricks. 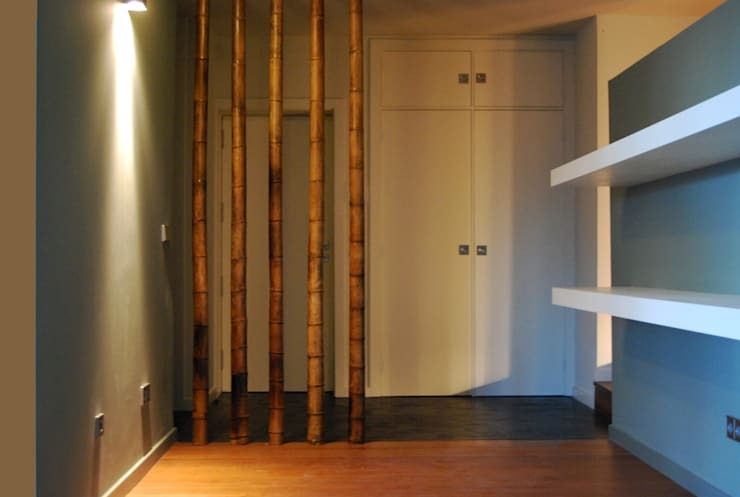 We simply adore how bamboo has been used to create a screen of sorts for the entrance of this room. 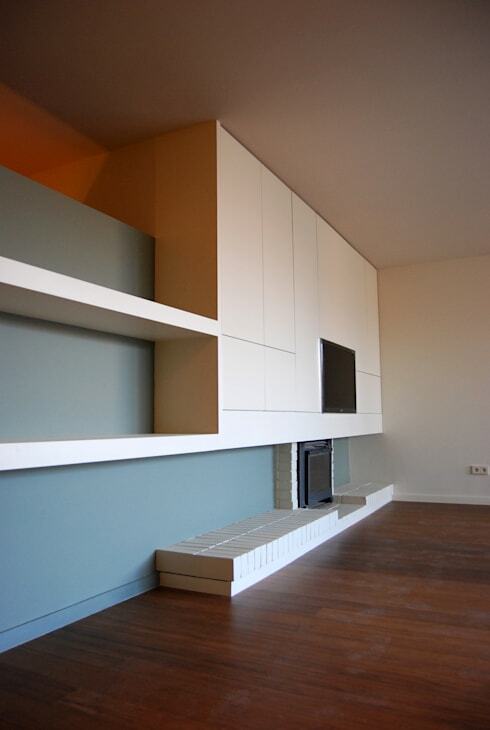 It complements the warm wooden flooring and balances the pristine whiteness of the closet and shelves. The organic aura pervading this space owing to the bamboo is unmistakable. The kitchen is galley style and makes clever use of the narrow space, offering plenty of room for cooking up gourmet delights! 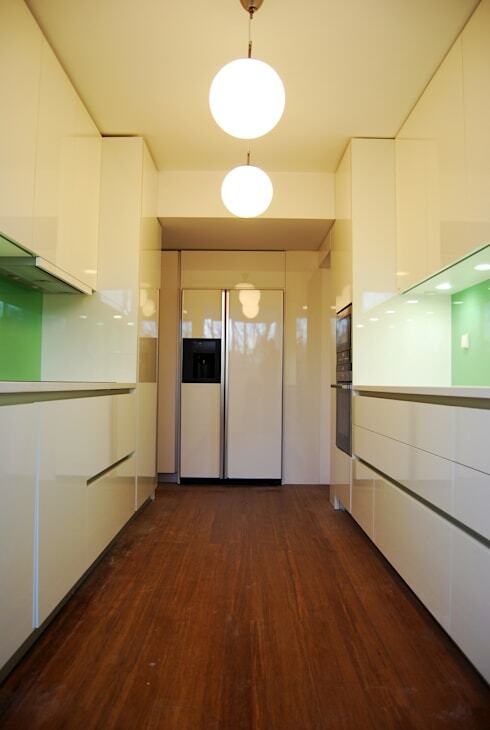 The wooden floor and hint of leaf green on the wall portions below the cabinets give the kitchen a subtle, yet exciting lift. And bright globular lighting makes the glossy surfaces sparkle. 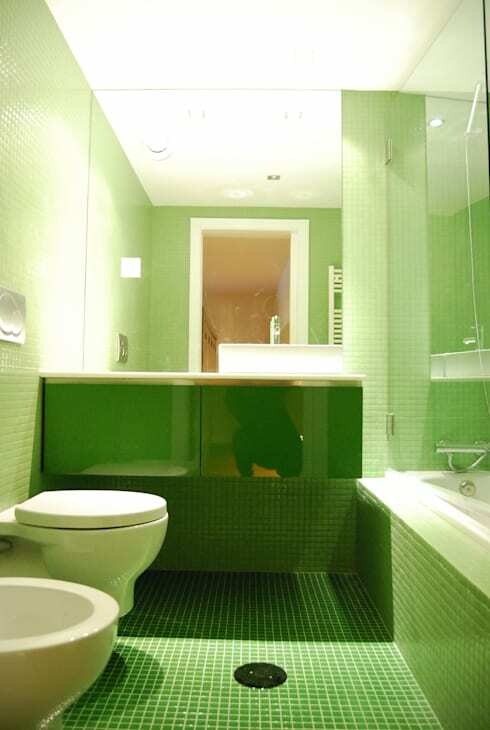 The bathroom now flaunts a striking green hue which makes the entire space come alive and feel refreshing. The mirror, the glossy sink cabinet and stunning mosaic tiles all come together to create an atmosphere which invites and rejuvenates. This home has been given a makeover that reflects its original warm and cosy vibe, but with a contemporary twist. The old elements have been replaced by bold hues and modish layouts which are more linear, trendy and functional. Looking for more inspiration? Check out another before & after story for even more inspiring ideas: Before and after: a Singapore home gets a chic upgrade. What do you think of this incredible glossy bathroom? Let us know your thoughts!